Coolgear Labs multi port USB Type-C / USB Type-A High powered charging circuit board is designed for integration into your own shell designs. Charge your laptops, add it to a charging cart or system and experience the benefits of high power charging. Fast Charge OLD and NEW simultaneously with Type-C and Type-A ports. Coolgear Labs USB PD Integrator design for high power 180W charging applications. It’s wide range of USB power delivery voltages are from 5V up to 20V. The USB-C port voltage and current are rated up to 41.4 watts per USB-C port, its Type-A ports are QC 3.0 with up to 18W per port. We have designed this board with an Injoinic chip for Type-C USB PD charging and high demand needs. This makes it an EXCELLENT choice for USB-C device charging applications! NOTE: This integrator board is meant to operate at a maximum of 180W total, exceeding this power range may cause damage to the board and or your devices. The following PD profile apply to this board. USB-C Power Delivery voltages range from 5V, 2.39A | 9V, 2.39A | 12V, 2.31A | 15V, 2.07A | 20V, 2.07A. 6 pin molex connector and wire schematic. Multi port device charging applications using USB Type-C Power Delivery. 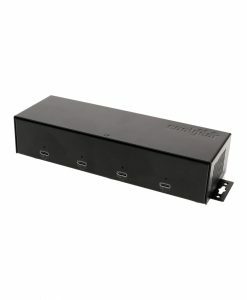 Laptop charging carts, cases and systems. HP, Dell, Asus, Apple MacBook or Chromebook computers. Retail displays for the latest USB type C devices. Works with ALL USB PD Device as well as Legacy Type A devices. 4x Downstream USB Type-C Power Delivery ports supporting up to 41.4W per port. 4x Downstream USB Type-A Legacy Port with QC 3.0/Apple Fast Charge supporting up to 18W per port. Can charge 4 Apple MacBook’s, Chromebook’s or other USB Type-C PD power hungry products. Supports all USB-PD Power Delivery voltages from 5V, 2.39A | 9V, 2.39A | 12V, 2.31A | 15V, 2.07A | 20V, 2.07A. Backwards compatible with all USB standards BC 1.2 and Apple Fast Charge as well as QC3.0. Supports USB-PD, SDP, CDP, DCP, BC1.x, SE1, Apple, Samsung, ACA-x, YD/T-1591, RIM etc. Operating Temperature: 0 to 55 Degrees Celsius. optional accessories for the USB PD Integrator Board for 180W Charging – USB C/A Multi-Port Board.